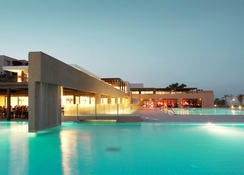 Sentido Atlantica is a luxury beachfront hotel in Kos, Aegean Islands, in Greece. The closest beach is a pebble beach, which is just 50m away from the hotel. The hotel has 5 swimming pools on its grounds. The hotel houses an exclusive upmarket spa and a health centre. The property has about 200 tastefully decorated rooms fully equipped with luxury amenities, giving the guests a lavish stay they expect and deserve. The hotel has 3 eating outlets that serve a wide range of delicacies from local and international cuisines. 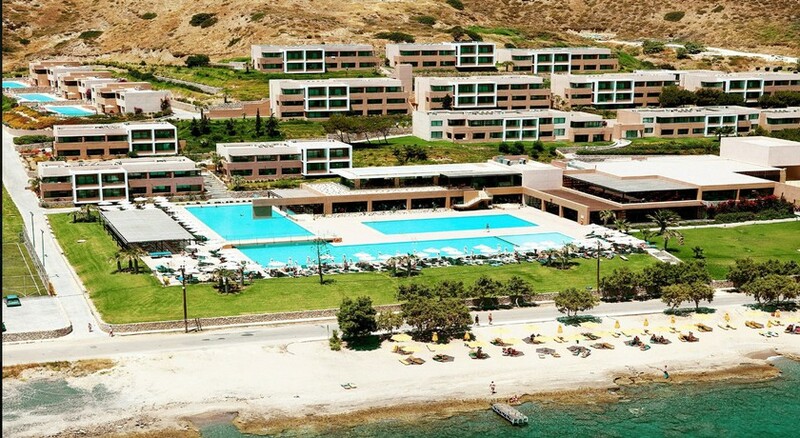 The idyllic location of the hotel makes it a perfect holiday destination for vacationers looking to spend a sunny, beach vacation in Greece. 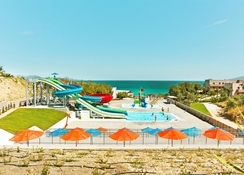 The SENTIDO Atlantica Carda Beach is located 7.5km from the Kos Airport. The nearest beach is located 50m from the hotel complex. The nearest city centre, Kardamena, is 1.4km away from the hotel. The nearest shopping centre is about 150m away. The hotel can arrange for rental cars for their guests’ local excursions and airport pick-up and drop-off if needed. The SENTIDO Atlantica Carda has about 200 tastefully decorated rooms. The rooms are fully furnished with every modern day amenity and facilities required for an ideal luxury holiday. The rooms are further divided into three types based on space, facilities and amenities. Double room, Double Room with Sea View, Suite Sea View and Sharing Pool Suite are the options available. The rooms offer either a sea view or garden view. The rooms have air-conditioning, sofa bed, king size bed, telephone, safe deposit box, satellite TV, kettle, mini bar, fridge, instant coffee-maker, tea-making facilities, hair dryer, bath linens, bed linens, essential toiletries, etc. The SENTIDO Atlantica Carda has 3 restaurants and two bars that serve a wide range of local Greek and international cuisines like Mediterranean, Italian, Asian, etc. and the bars are known to serve local wines, beers, signature cocktails, alcoholic beverages and non-alcoholic beverages. 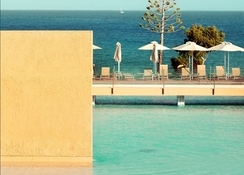 ​Mediteranneo, Wok N’ Roll, Lo Spuntino, Pool Bar and Blue Moon Bar are the bars and restaurants at the hotel. The guests can also try local bars and restaurants in Kardamena town. The hotel houses multiple outdoor and indoor swimming pools with water slides which serve as a great recreational aspect for the guests, where they can enjoy pool games and refreshing dips. The guests can enjoy activities like water sports, tennis, table tennis, soccer, billiards, aqua aerobics, discovery walk, cooking sessions, local wine tasting, treasure hunts, mini disco, creative sessions, etc. Guests can also try local sightseeing. Spent a great 2 weeks at the hotel with my family. The hotel was amazing and had everything we required for our 2 week stay, The staff were awesome and was so friendly and helpful all the time. I must say especially the bar staff, Michalis and Dionisia and David., The facilities were great and we were only 10 min walk to town. the only down side were as we were 5* all Inc the drinks weren't the best but you can make do with what is available. Great hotel great people. Had a lovely time at the carda beach hotel, everybody went out of their way to make our stay very enjoyable. Food was good with something for everyone, rooms are lovely very clean and comfortable. Staff could not be more attentive. It's a lovely place with good facilities and modern design. The All Inclusive food is varied and fresh. The only drawbacks are the beach, to get to which you have to cross sometimes busy road and with AI for some reason you have to pay for regular Freddo coffee in the pool bar. Otherwise it fully does the trick and from what we saw in the surrounding areas - this is by far the best choice.